Shameless gloating: This article has just won a Solas Award for travel writing in the “Animal Encounters” category. 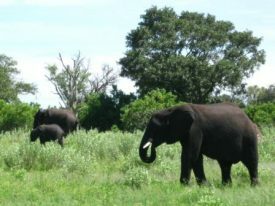 I took this trip in 2010, when I co-led a writing safari in Botswana with Bill Given of The Wild Source. But you don’t have to travel to Botswana to take my workshops. I offer online travel writing classes too! It’s 4:23 a.m., and all is quiet in the Okavango Delta. Wait, no. That’s not right. Let’s start over. 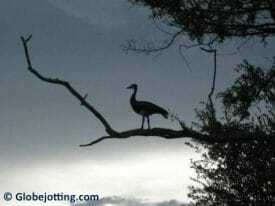 It’s 4:23 a.m. in the Okavango Delta, and I can’t sleep because the birds are antagonizing me. I don’t know what their problem is. Sure, I’ve come to Botswana to check out the wildlife, but it’s too early for such boisterous chirping. You’d think that in rural Africa, if an animal was going to disturb me with loud noises, it would be a big animal like a roaring lion or a trumpeting elephant. But no. It’s the birds. Some warble. Some squawk. Some chatter. Some cluck. One species sounds like a frog. Another sounds like that guy behind you in the supermarket line who you want to strangle because he will not stop whistling the same six notes, over and over. Then there’s the Blacksmith Lapwing, so named because its call resembles a blacksmith’s hammer striking an anvil. I don’t know if you’ve ever tried to sleep while someone banged on an anvil outside your bedroom, but it’s not a restful experience. Really, bird? It’s 4:23 in the morning. The bars are closed. Leave me alone. I lie awake, wishing my safari tent had better sound-proofing. When I finally start to doze, a new sound rips through my slumber. “Whoooo!” it echoes through the trees, and I think, “Great. Now I’m being haunted by a ghost-bird.” But later I find out it was not a bird. Or a ghost. It was a hyena. Apparently, hyenas do not always laugh. Sometimes they haunt. I assume this is a scare tactic to shut the birds up, but it’s useless. In daylight, the sounds of the Okavango Delta change. The bigger animals make their voices heard. Elephants and lions trumpet and roar. Baboons in trees hoot out warning calls. Hippos snort through gaping mouths. At civilized hours, I like hearing the animals. After several days, our safari moves to the Kalahari Desert where I discover my favorite beast of all – the wildebeest. Wildebeest sound a little like Muppets. “Murp!” they say, in a higher pitched tone than one would expect from an animal four times one’s weight. Imagine a cow, with a stuffy nose and a large mouthful of lasagna lodged in its esophagus, attempting to moo. That is the sound of the wildebeest. The sound is above me, flapping around inside my room. It’s not a bird. It’s a bat. It’s 3:30 a.m., and the bat darts through my flashlight’s beam just long enough to startle me. Then it disappears into the rafters, never to be seen again. But I hear it – every time I roll over in bed. It keeps me awake the rest of the night. Bats are harmless to humans. That’s what Bill tells me the next morning. Bill and I are working together on this safari. He’s our group’s wildlife specialist. I’m teaching writing classes along the way. When it comes to animal behavior, I normally trust Bill’s knowledge, but when I have not had a good night’s rest in five days, do not tell me that a bat flapping above my head all night, depriving me of sleep, is not in some way hazardous to at least my mental health. But I’m not so much afraid of the bat as I am annoyed. To illustrate this point, I tiptoe behind Bill while he’s eating. I hiss in his ear, “Phwt phwt phwt phwt.” This is effective. The next time someone tells you bats are beautiful creatures that we should embrace, hiss that noise repeatedly in their ear when they’re not expecting it. They might punch you, but they’ll get your point. After two weeks in Botswana, however, I grow so used to the animal sounds, I hardly notice them. They become soothing white noise, like the whirr of my electric heater at home. When I finally return to my apartment in Seattle, I miss the calls of Blacksmith Lapwings and Cape Turtle Doves. I long for a hyena to haunt me in my dreams, or a herd of murping wildebeest to gather outside my bedroom at night. I remember my first pre-dawn morning in the Okavango Delta, when all I wanted was for the birds to shut their beaks and let me snooze. Now, I miss the symphony of rural Africa. Home in Seattle, the big city seems too quiet. Here’s a short video clip I shot of wildebeest chilling at the aforementioned watering hole. (No, literally, it’s a real watering hole. Not a bar.) It’s not great video, but if you listen closely, you can hear them murp. LOVE this story! Congrats on the Solas award! Congratulations on the award! Well deserved for a great post! I am just working on my blog about our trips to the same places you are going on your upcoming Tanzania – plus the Masai Mara. If I could, I would join this one, too. The first thing Rob and I said when we returned was, “We have to go back!” It was the greatest trip we have taken so far… bucket showers and animals right outside our tents notwithstanding!